Product prices and availability are accurate as of 2019-04-20 12:29:37 UTC and are subject to change. Any price and availability information displayed on http://www.amazon.com/ at the time of purchase will apply to the purchase of this product. Protect your family from the sun with this OILEUS beach tent sun shelter. 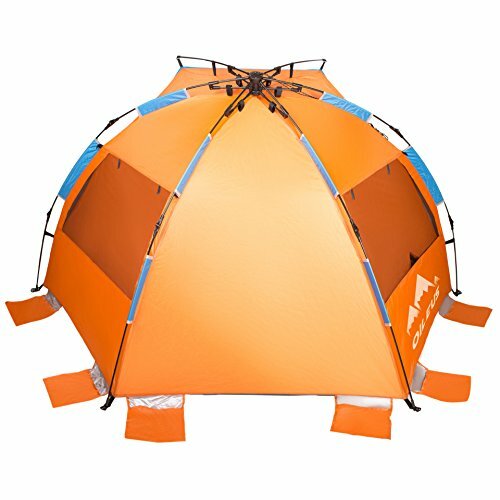 This X-Large functional orange shade features 2 windows,6 sand pockets and special UV Guard material for maximum shade at the beach. Specially designed for easy set up and fold down in seconds. Flysheet: 210T Polyester with water resistant PU coating. Frame: 6.9mm fiberglass pole, easy setting up and folding down system. UV protective coating rating 50 + UPF. 2 side screen netted windows with roll up cover. Comes with 6 sand bags pockets on both side panels, 4 steel pegs for fixation. Full size carrying case with shoulder strap. 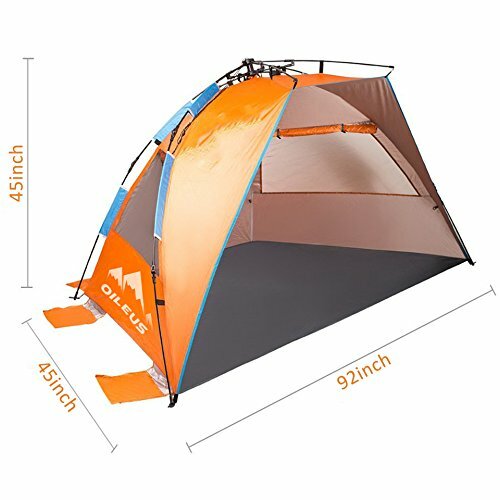 Tent dimension: 92 L x 45 D x 45 H (Interior height is 40"). 1. Lay the Sun Shelter flat, make sure poles are fully extended and spread out. With both hands, pull top two strings upward. 2.Continue to pull the two cords up and out until the hubs come close together. 3.Pull until the upper and lower sections of the hub connect. As hubs get closer to connecting, the resistance will increase and the body of the shelter will bow out. 4.After it's locked in place, stake out the corners and guylines for added stability. 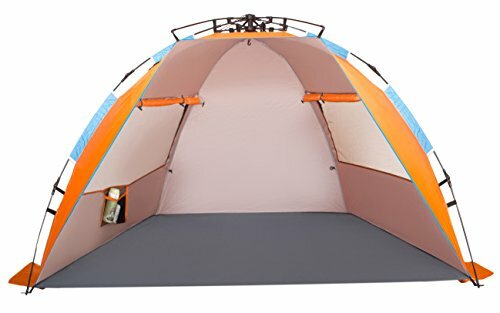 Easy Setup and Portable - This instant beach tent features automatic patented pop up mechanism, makes it fast and easy to take down and fold back in under 30 seconds. 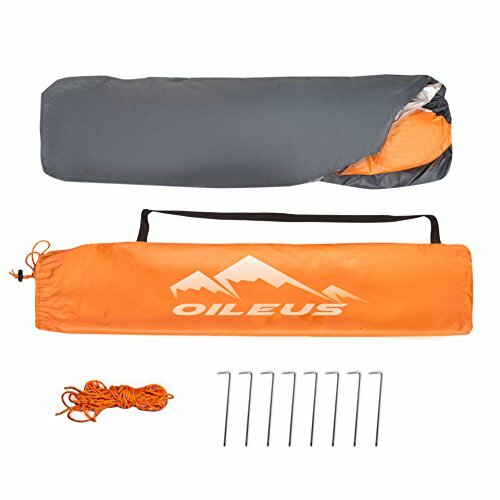 Light weight at 4 lbs, packs down to 32" x 5" for easy carrying and storage. Strong and Durable - Umbrella rated 3000mm PU coating by newest breathable 210T polyester, anti 99% harmful UV, durable floor made of 150D PE; thick 8.5mm fiberglass poles for added stability with stakes and guy rope. Luxurious Space - XXL Large size: 92" x 45" x 45" providing generous space for upto 4 adults. Spacious design provides more comfortable cooling shade and easily to relax inside. New Design - Featuring an awning for extra shade, 2 windows for maximum ventilation and air circulation; providing a spacious interior shelter and has internal pocket to store personal items. 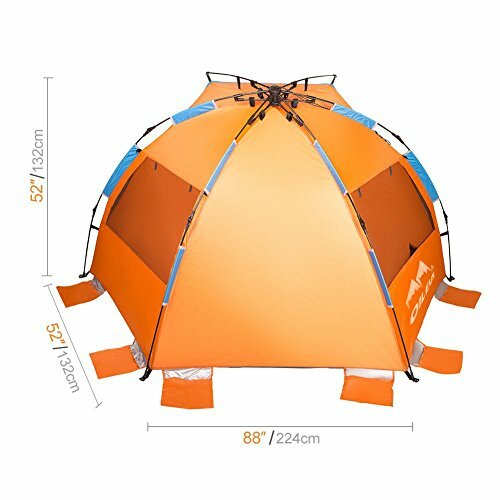 Package Including - 1 beach tent,1 instruction, 1 carry bag with shoulder strap, 6 sand pockets, 8 steel stakes, 4 guylines and 1 storage pouch; Customer friendly 1-year warranty; if you have any questions, do not hesitate to contact us though Amazon.